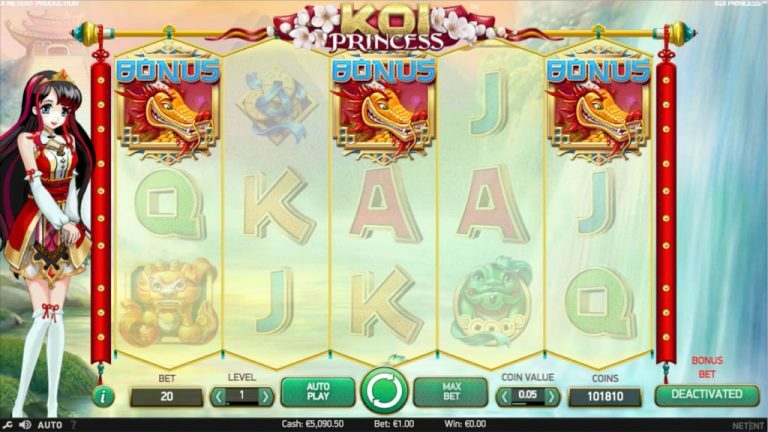 Koi Princess is a 20 payline, 5-reel slot from the world-renowned developers, NetEnt. Koi Princess has an Asian anime theme and is loaded with plenty of features to keep you well entertained for hours. This is certainly not a regular NetEnt slot and boasts some unique features you won’t often come by, including random features and a bonus bet mode. As mentioned, Koi Princess has an Asian anime theme. The reels are filled with a selection of traditional Japanese dancing dragons and coins. The reels are flanked by Japanese decorations and accompanied by soothing Japanese music. Overlooking the action is the Koi Princess herself, who stands to the left of the reels. Getting the action started follows the regular process for NetEnt slots; set your coin value between 0.01 – 1.00. Then, set the bet level between 1-10, this is essentially the number of coins multiplied by the 20 paylines that will be applied to each spin. Finally, hit the Spin button and the reels will be set in motion. This slot has an interesting Bonus Bet option. This is an option that you can enable for each spin and it doubles the cost for the spin. What is the benefit of you paying double? It increases the probability of awarding a bonus feature or random feature. It also changes the values on the Bonus Wheel and if you get the Sure Win Free Spins feature, it increases the coin wins. While the Bonus Bet can chew away at your balance, it can also boost it plenty. 5-Hit – This will give you 1 spin with a guaranteed 5-symbol win with a random symbol on a betting line. Random Wild – Awards you a spin with between 4 – 9 Wilds placed randomly on the reels. Wild Reels – With this random feature, anywhere between 2 and 5 reels become entirely covered in wilds. You can only imagine how big the wins must be with this one!! Bonus Activation – This feature gives you a spin with 3 Bonus symbols, resulting in the activation of the bonus feature. Note that only 1 random feature can be activated per spin and they do no activate during bonus features. Koi Princess has 10 symbols. There are 5 higher paying symbols, and the Wild symbol is the top paying followed by the Koi princess. The lower paying symbols are the regular 10, J, Q, K, A. This slot boasts a selection of bonus features which are triggered by getting 3 Bonus symbols that can appear on reels 1 ,3 and 5. What really is cool about Koi Princess is that if you only get 2 Bonus symbols, it’s possible for one of the reels to nudge and a third Bonus symbol to appear. As mentioned earlier, you could even be awarded a bonus feature randomly when you are playing. Once you achieve the bonus round, there are 4 different types of bonus rounds and one of them is awarded randomly. The 4 options are the Bonus Wheel, Coin Win, Sure Win Free Spins and Wild Reels Free Spins. Bonus Wheel – This is a bonus game where you can win coins and possibly activate the various Free Spins games. The bonus wheel has 3 tiers and 12 locations. You then need to click on the dice to move around the wheel. You can win multipliers ranging from 2-5, Double up, Wild Reels Free Spins, Sure Win Free Spins and coin wins. Coin Win – As the name implies, you will win a random amount of coins. Check out below for more info on the various Free Spins rounds that can be won. Sure Win Free Spins – To start with, you will receive 10 free spins, but there is an interesting During this feature, the first initial spin pays out the bet amount from the round that triggered the feature. Then, ever free spin thereafter is guaranteed to pay out at least the same amount as the highest win thus far. If you were lucky enough to get a really big win on the second or third spin, you can only imagine just how much you will win because the next 7-8 spins will pay at a minimum of the same amount as the big win. Wild Reels Free Spins – This feature awards you 10 free spins. During each free spin, between 1 and 5 of the reels at random will become entirely covered in Wilds. Koi Princess doesn’t offer a fixed jackpot or a progressive jackpot. When you take all the extra features and the winning potential they provide as well as the Bonus Bet option, this slot certainly can pay out some handsome rewards. Koi Princess slot has 20 fixed paylines. The game has medium volatility, which is great for a slot with so many features like Koi Princess. Simply spectacular! Koi Princess is eye-catching, the imagery is right on the money and the soundtrack is perfectly matched. Gameplay is smooth, and the Bonus Bet feature is a great addition. The in-game features and various Free Spins rounds are well thought out and offer a nice twist compared to most other slots. 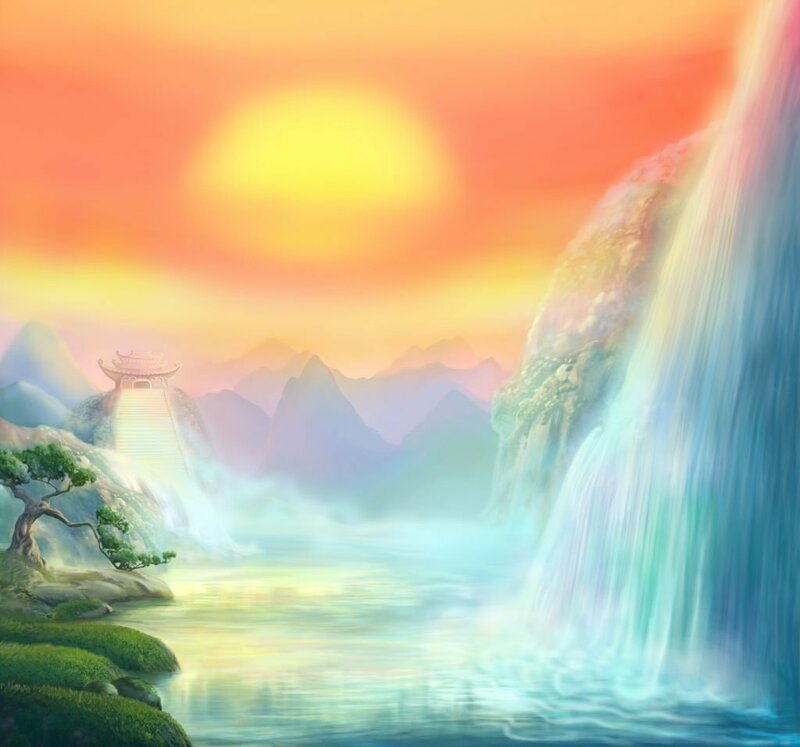 NetEnt has done a great job with this one, unfortunately, some players may not be attracted to the theme, but keep an open mind and try Koi Princess out; it really offers some good fun and excellent winning opportunities. Take Koi Princess for a spin now at Casumo!